The cube. The Cube. THE CUBE. The giant purple cube in Fortnite: Battle Royale continues to mystify fans. 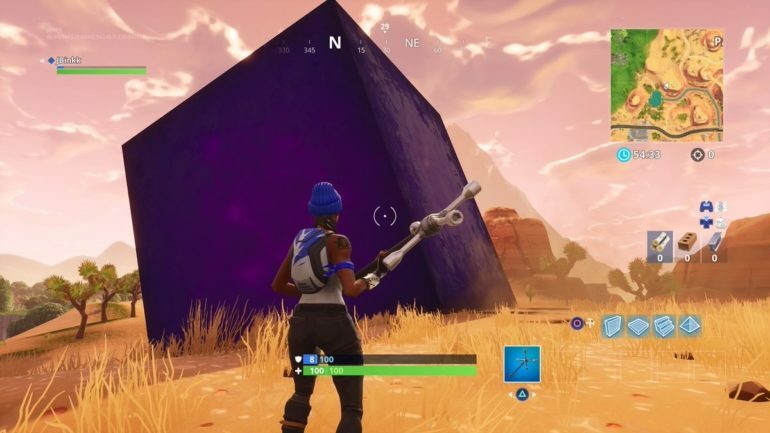 Today’s big development is that the cube changed its direction, and it now seems to be tipping toward Fatal Fields. Many people thought the cube was destined for Salty Springs, with the cube seemingly going directly northwest toward Salty. The big block decided it wanted to switch things up, however, and it turned its attention southwest, where Fatal Fields is located. It’s still unclear whether the cube will actually make it to Fatal or what it will even do at Fatal. The cube was spawned from a powerful lightning strike last week, and there’s been no hints at about what it really will do the game. Whatever it is, it’s really capturing the interest of fans. It’s a magical giant cube and people can’t stop talking about the effects it could have on Fortnite.